As a beginning artist, you probably suffer from this dilemma of disastrous details. Probably without even knowing it. You may have seen me write that beginning artists make creating art much too complicated. One of the reasons for this is the common tendency to become entranced with drawing or painting every disastrous detail you can see. I say disastrous details are a dilemma, because too many details actually detract from your art. When you study the work of many good artists, you see they avoid this dilemma. Look at this painting by Hall of Fame illustrator Mark English. You don't see any more details included than were absolutely necessary. 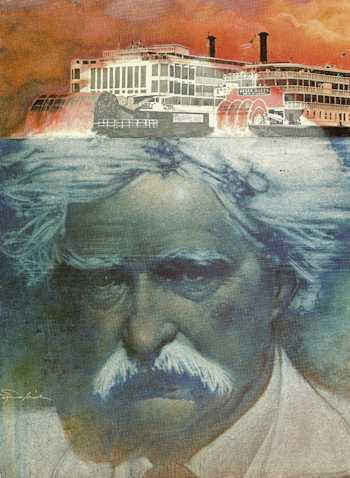 Look how simply he did Mark Twain's hair. He didn't try to exactly reproduce every last strand. He only shows you enough for you to recognize who this is and know that Mark Twain had one bushy head of hair. English does the same thing in the rest of the painting. Very simplified. He only includes enough detail so you know what everything is. Now, in order to learn to simplify like someone of Mark English's caliber, you need to start simply, as well. 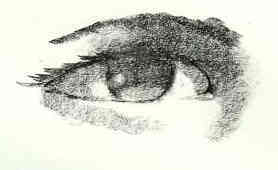 You avoid the dilemma of disastrous details by practicing simplicity on small things first – like eyes, for instance. Look at how English depicts the eyes. You see hardly any detail. You don't need to. You know from the shapes and the placement, these must be eyes. That's often the opposite of how beginning artists depict them. Often this is how I see aspiring artists draw or paint an eye. Look how flat it seems. 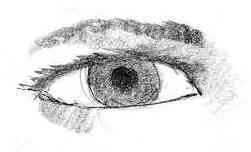 And, while the iris is a part of the eye, when you go to great lengths to show it, it can make the eye look like the owner is on drugs. The eye is a sphere embedded in your eye socket. It's almost always shadowed. The only time it would be white is if you pulled it out of its socket and cast a bright light on it. Even a highlight on the eye is never pure white. It is only a lighter version of the color that is there. Now look how much more real (and more round) both of these simple eyes look. In this last one I've escaped the dilemma of disastrous details. I've simplified even further by flowing the shadow under the eyebrow into the eye itself. Much like Mark English did in his painting of Mark Twain. It still looks real. It still looks round, and it shows how simplicity makes art much more interesting and…well, simpler. P.S. 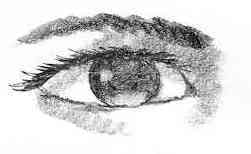 It is the gradual accumulation of important bits of knowledge like how to simplify eyes that lead you to the secrets of creating good art. When you learn to simplify one thing, that one thing leads to trying to simplify other things. Because it's pretty damn fun when you do it. Eventually, you find art becomes much less complicated. That's because you've learned to eliminate the dilemma of so many of the extraneous details that used to bog you down. And that's when making art becomes much more fun and much more creative. It's these little bits of important knowledge that I'd like to teach you in the future webinar I am planning. What is it that you are struggling with right now? How could creating art be made easier for you? How could you free more of your creativity? And what would that feel like?